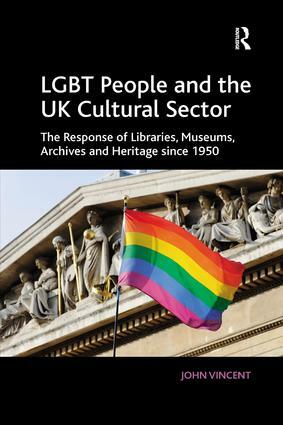 This book examines the complex and conflicting relationships between LGBT people and our cultural and heritage organisations including libraries, museums and archives. In this unique book established author John Vincent draws together current good practice, and also highlights issues which urgently still need to be addressed. To set the work of libraries, museums and archives in context, Vincent traces the development of LGBT rights in the UK. He goes on to examine some of the reasons for hostility and hatred against this minority group and critically explores provision that has been made by cultural and heritage organisations. He offers examples of good practice - not only from the UK, but from across the world - and draws up an essential 'charter' for future development. This compelling, practical book should be read by managers and staff in libraries, museums and archives around the world looking for guidance on this important issue. John Vincent is the Networker for 'The Network - tackling social exclusion in libraries, museums, archives and galleries'. He has worked in the public sector since the 1960s, primarily for Hertfordshire, Lambeth and Enfield library services. In 1997, he was invited to become part of the team that produced the UK’s first review of public libraries and social exclusion (from which The Network originated). John now runs courses and lectures, writes, produces regular newsletters and ebulletins, and lobbies for greater awareness of the role that libraries, archives, museums, and the cultural & heritage sector play in contributing to social justice. He is particularly interested in supporting the work that libraries do with LGBT people, young people in care, older people, and with ’new arrivals’ to the UK.